One of the first books I bought for my son when he was born, I stumbled across my sister's copy inscribed to her from my dad ~ March 1978 ~ in the guest room at my mom's house. Subtitled The Tasha Tudor Book of Holidays, it is in the top three of my favorites from childhood. My son loves it for the animals, but I was enchanted by the many puppet shows and costumed games and holiday parties that flood the world of Ms. Tudor. As mentioned in a previous post, Ms. Tudor lived (and still lives) the world that she draws... and raised her brood in a house that was frozen in time. Covering the fun of every month of the year, each section begins with a famous quote and is illustrated with detailed paintings of the festivities. Midsummer's Eve comes in June. That's when we had a marionette show. There were many, many rehearsals -- marionettes to make -- scenery to paint -- and programs to print and color. The play was at night in the carriage shed. Grandmothers had the very best balcony seats. Refreshments were served at the intermissions and everyone had a wonderful time. 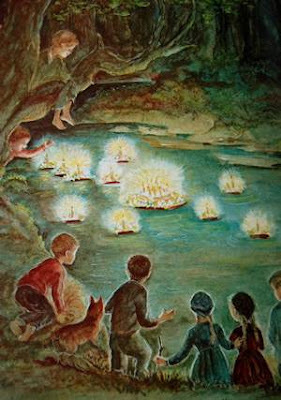 The scene when the little girl's birthday cake floats down the river followed by a sea of candles is just about as magical as it gets. And the Easter tree with the live bunnies caged beneath... forget about it. Reading about these celebrations will get any parent jacked up to celebrate May Day and Midsummer's Eve... even if the handmade May baskets and fully-constructed marionettes are way too much for the contemporary parent to swing. We can dream though, right? NOTE: Readers just let me know she passed last month. May she rest in peace for sure. Oh, how we love Tasha Tudor around here. I hate to be the one to let you know though, that sadly she passed away June 20. Our favorite around here is her Pumpkin Moonshine. Love Tasha Tudor... I am so sad... did not know she passed away. thanks for the post. oh man! I did not know that. That's what i get for being out of touch. too sad. my mom is gonna be heart broken. my dad too. my son has a signed painting by her in his room that my parents bought from her when they were first married. I'm readng this kind of late - but I have to comment. I love Tasha Tudor. I was obsessed with her books growing up and I always wished that I lived in one of her stories with a doll named Annabelle and an actual "doll" house where she and her friends could eat tiny cookies that I would bake. I was meant to wear high button shoes and carry a parasol on sunny days. Alas - I was born in 1972 and I had to settle for wearing my patent leather mary janes with the standard issue bell bottom jeans. I really need to send you some of my favorite book titles....you've actually already featured a few!